One of the ways to get your first rung on the ladder in an IT career. Hugely influential to the image of the IT organisation in general. It should be treated as one of the most important teams in IT as this is the link from IT to the business day to day. Should be a feeder team to other IT teams for individuals to move into a more specialised field. Usually consist of individuals with a technical or people orientation. A great way to influence the relationship with the business. IT is all about creativity, looking for new ways to use existing and new technology to solve problems and enhance the services delivered to the business. As a result of what ITIL and a Service Desk means to me, I came up with ‘The Service Desk Triangle’ which satisfies all these points, encouraging personal growth / knowledge and really try to highlight talent to other teams, making sure the individuals career path continues with the company. The base layer to the pyramid would be to encourage knowledge sharing and reporting to highlight and fix any knowledge gaps. This can be as dull as ditchwater but the purpose is to make sure there are no ‘favourites’ in the Service Desk. Everyone should be able to do all the tasks as the team would work to produce documentation detailing all the work instructions. I would suggest in a structured method of a 2×2 grid. e.g. These would be the programs key to the business e.g. a sales database. The team would focus on documentation which is very detailed and means the team is ready for any incident regarding this. This should details how backups are taken and when, when updates are sent out, what this might affect etc. Building up a picture of how PC’s are updated so if an issues arises due to an update the team are better equipped to diagnose the issue quickly. This documentation would be reviewed in weekly team meetings, the team suggesting any improvements. All the time working to get to a one definitive document which is followed by the team. Nothing should be in someones head that is not in the documentation. The other key activity in this level would be reporting. The Service Desk Manager would be looking at reporting and statistics of the team e.g..
Who is picking up the incidents after 10 mins, 20 mins, 30 mins, 1 hours. Are there team members who do not know how to do the more complex calls and are leaving them in the queue, which may mean more training? Are particular team members picking up particular types of incidents, again, maybe highlighting skills gaps in other team members. This level is really to make sure all the team members are able to pick and deal with every type of incident and request which comes in. Therefore, when moving onto the next stage, team members can be taken away from there normal day to do activities without a drop in the level of service. The next level tries to develop the mindsets of technical or people orientated team members within service desk and encouraging development into other teams. A Virtual Network gives the service desk staff a safe way to try out new technologies and to test out new and existing working methods. Working on the idea IT is all about creativity, this provides a safe environment to express their creativity in building a network and testing new features. Team members can highlight talents to more senior teams, creating a chance for promotion when the time comes. Structured meeting between the service desk and business units to help gain a better understanding how the services provided by the IT organisation are used and if there are any enhancements to be made. Leverages off the relationships already formed through the daily interaction between the business and the service desk. Ideally, I would like to see the Service Desk team members actually work for one week within each business department. All IT privileges would be revoked, the team member would only have access to the resources the business unit has. This allows the team member to appreciate how IT is used and the limitations. Proactively showing the business the IT department is trying to understand how the software is actually used and any issues or improvements which could be made. After one week the team member would present their findings to the team and any other departments which could provide further assistance to improve the service. The pinnacle of the Service Desk Triangle, which builds on the knowledge of the previous three sections and allows the Service Desk team members a chance to develop any enhancements or ideas they may of had after completing the previous last three stages, within a 24 hour time frame. The team member can work away from the Service Desk and their day to day work to develop an idea. After which they would need to present their ideas to the rest of the team. Some ideas might not fly but each team member should not be discouraged from trying as other will and this whole structure is trying to find new and better ways of doing things. All the time striving to provide a better, value for money service to the business. Are there better ways of doing some of the procedures in level one? After looking at a functionality on a VM network, could this be used in the production network? Could a business unit’s spreadsheet be imported into Sharepoint, making it easier to update? 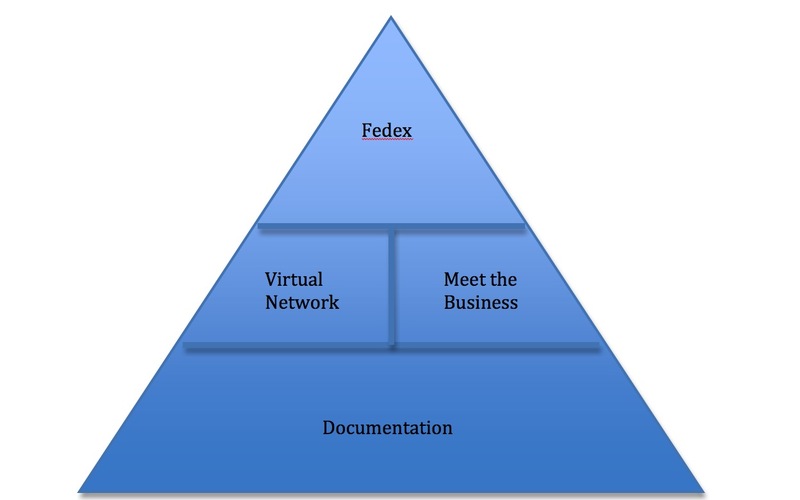 I believe by following this triangle, the service desk becoming much closer to the business and proactively finds ways to improve the service to the business by first hand experience of how the business works with the IT services. Thankyou for reading my post. This is my opportunity to blog about a subject I love but am still learning. These posts are my way of showing how I understand the subject, however, I would encourage you to leave comments, did you agree / disagree with the post? Did I not explain something well enough or incorrectly? Do you want me to blog about another subject within ITIL? All feedback helps me to understand more. Thankyou. Next PostInterior design, the ITIL way. I’m sorry my blog ate your post. I will remember to feed it more regularly to stop this happening in future. I am also very new to this but I would get a twitter account with the same branding and get people to subscribe to that to be alerted to updates. Also find top bloggers on your subject and comment on their posts, maybe linking to yours. Today I made a break through and one of these experts, tweeted a link to my blog and my stats have gone through the roof because of this. I guess its all about getting the word out about your blog. Really appriciate it that you enjoyed reading my blog and hopefully see you in future on here. Hi Logan, Yo can thank Word press for the speed but thankyou for your comments on my blog. It really means alot to know I people like what I am writing. hope to see you on my blog soon. of to keep it sensible. I cant wait to learn much more from you. Thankyou for your feedback but not sure I understand your question? Really pleased I could help. Please let me know how it goes and hope to see you back on the blog soon. Excellent. Glad you enjoyed it. Always nice to get postive feedback and know I am going in the right direction. Hope to see you soon back on this blog. Hi, Can you expand on what you would like to me to write on? On the service desk in general or how the triangle would work in practice? You can thank WordPress for the speed, but thankyou for your comments on the content. So glad to get so many positive comments on my blog. Hi, I don’t have a video on this. What else would you like to know? hi, interesting question. I don’t really think I centre myself, the articles usually come to me as I am going about my day and it sort of forms in my head to write down notes and then expand on them. Read other peoples blogs and twitter feeds for inspiration. Thankyou everybody for your comments. It really means alot to me, as I am just starting out and sharing my ideas, to get such great feedback on an idea which is pretty out there and non conventionial but I think could really change how the Service Desk are seen and do amazing things for the image of IT to the business. Thankyou. articles. I will bookmark your blog and take a look at again right here regularly. I am relatively certain I’ll be informed many new stuff right here! weblog. Is this a paid themme or did youu customize it yourself? My brother recommnded I might like this website. He was totally right. This post acctually mazde my day. It’s hatd to find educated people for this subject, however, you seem like you knnow what you’re talking about! I ill be grateful if you continue this in future. A lot of pewople will be benefited from your writing. this blog consists of awesome and actually fine material in favor of visitors. will be waiting for your further write upps thanks once again. This blog is all about making IT more user friendly by looking at ITIL, Service Management and everything else to make IT better. Please leave comments and tell me what you think, this is also an opportunity for me, to write down my ideas and get feedback from everyone to help me understand the subject better.